The AlSi alloys with 17%-35% silicon content has excellent friction performance. The high silicon aluminum alloys can be applied as wear-resistance material and applied in all means of transportation and motive power machine, machine tools and special fastener and tools. The features of the high silicon aluminum include proportion, light weight, excellent thermal conductivity, low coefficient of thermal expansion, volume stability as well as wear resisting, stain resistance, etc. 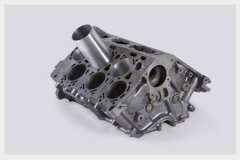 In the auto parts industry, it can be used as the automobile engine cylinder liner, piston, rotor and brake disc material.